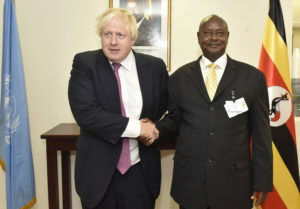 President Museveni (right) with UK Foreign Secretary Boris Johnson during a meeting in New York City yesterday. PPU photo. President Yoweri Museveni has held talks with the United Kingdoms Foreign Secretary Boris Johnson on the situation in Somalia, South Sudan and Burundi, telling him there must be a more serious concerted effort to flush out Al-Shabaab militants from Somalia and called for the strengthening of AMISOM through provision of more equipment and personnel to finish the job. Uganda was the first country to deploy in Somalia in 2007 under AMISOM. Together with other Troop Contributing Countries (TCCs), they have made significant contribution to peace and stability in Somalia, providing a conducive environment for socio-economic development of Somalia. Sporadic attacks by militants, however, threaten to reverse the peace gains. On the situation in South Sudan, the President said regional leaders are involved in a flurry of activities to reconcile factions in the South Sudan conflict to stop the suffering and stem the flow of refugees to neighbouring countries. According to the UNHCR, over the past 12 months, an average of 1,800 South Sudanese have been arriving in Uganda every day. In addition to the million there, a million or even more South Sudanese refugees are being hosted by Sudan, Ethiopia, Kenya, Democratic Republic of the Congo and Central African Republic. President Museveni said they are working on efforts to ensure unification in Burundi. The President who is in New York to attend the 72nd Session of the United Nations General Assembly was meeting M. Johnson at the Uganda Permanent Mission Offices in New York. Uganda’s Minister of Foreign Affairs Hon. Sam Kutesa and the Permanent Representative to the United Nations Adoniya Ayebare attended the meeting.